This was the best so far. Since I’ve moved to Eugene in 2005 I’ve attended annual Carnaval events at Cozmic Pizza if I was in town. 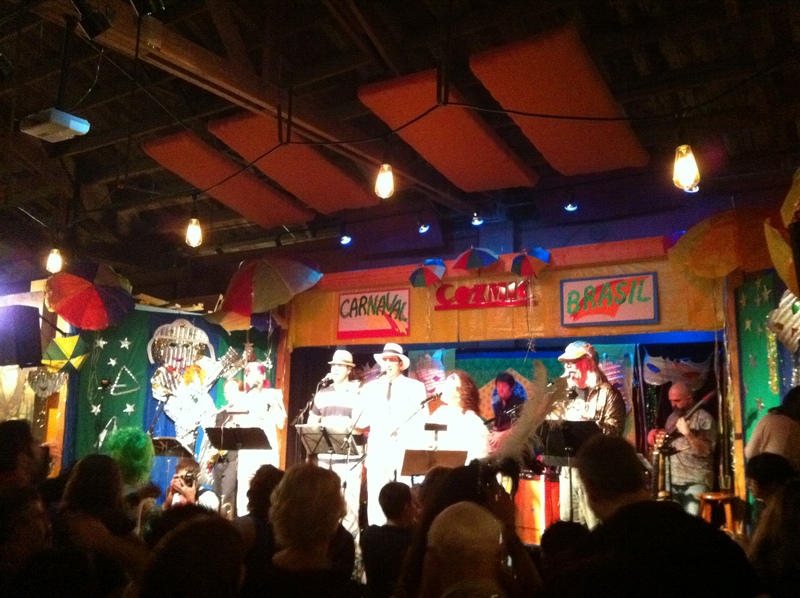 It is a great opportunity for people to enjoy the bands dedicated to Brazilian music in Eugene. Difficult to believe it, but there are five different groups of musicians dedicated almost exclusively to Brazilian music here in Eugene. For such a small town, this makes Eugene a privileged town for Brazilians. This year the event took place last Saturday, March 3rd. Edson Oliveira started at 7:30PM. Edson’s group has been expanding the repertoire and including more musicians along the years. Originally Edson focused on Tom Jobim’s classics only. Now his band has plays Bossanova and also includes other music, from the Brazilian Popular Music (MPB) to some old style Sambas and to Chorinhos. Edson’t band sounded great. I really enjoyed the old sambas and the Chorinhos! All in all, his band played in the spirit of Carnaval. Then came my favorite band in Eugene, the Macaco Velho. Heliane and John have put together a great selection of “Marchinhas de Carnaval.” Normally you can’t stay on your seat when they perform the Forrós and other Brazilian folk music and sambas. They practically force you onto the dance floor. And when you add the Marchinhas de Carnaval to the mix, then I will say it was total success: they revived that Carnaval spirit that could only happen on those Brazilian small towns where Carnaval existed on a small scale and where everyone was a part of it. It was great to be there last Saturday and experience this feeling. Finally it was Samba Já’s turn. Samba Já is already an Eugene fixture. The beat of the Surdo drums carries the spirit of Carnaval. They are also very integrated with the public, they make you part of the show. And that’s one of the things that make Samba Já so special. Being a small town most everyone in attendance on these events know each other. And the musicians, they almost play interchangeably across all these bands. Some actually have played on all three at some point in time, and last Saturday a few of them played on at least two of them. It is like a big family united around Brazilian music. One of the organizers for this year’s Carnaval was my friend Kelly Tavares. Congratulations! Your team’s work, together with improvements made by Cozmic pizza (by opening floor space for dancing and also their promoted changes to food and drink services), and the three bands showing so much progress, all of you made for a great evening. I was never a fan of Carnaval when I lived in Brazil. But being here in Eugene I consider it a pleasure and a privilege to have the opportunity to enjoy Carnaval at such a high level of quality and professionalism. To everyone involved in the making of this event, thank you. Definitivamente um daqueles eventos que da o que falar!!! Obrigada pelo carinho Cesar. Postei as fotos no meu blog agora, da uma olhadinha vc ta la tb.